Diamond is a mineral consisting of pure cubic crystallized carbon. The chemical bonding of the carbon atoms makes the diamond the hardest known material. Thus the diamond is the only mineral to receive level 10 on the Mohs scale, which describes the scratch hardness of a mineral. 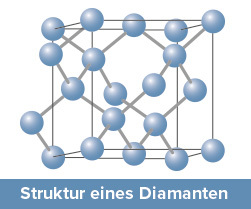 The carbon atoms are connected in a regular crystal lattice and form the typical octahedron, dodecahedron or cube shape of a diamond with curved surfaces and rounded tips. The weight of a diamond is measured in carats, the weight unit for gems. 1 carat = 0.2 g.
Natural diamonds are formed from graphite in an endothermic reaction deep inside the earth at temperatures of 1250°-1500°C and enormous pressure. Diamonds are found in kimberlite, the so-called parent rock, which is brought to the earth's surface by volcanic activity. Different types of diamonds can be used in industrial applications. In addition to the careful selection of the right diamond for the respective area of application, precise grinding is also important to ensure a long service life and the best possible results. to the different properties and qualities, natural diamonds are selected for industrial use by experienced specialists. Natural diamonds are mainly used as seam stones in octahedral or dodecahedral form. Mono-crystalline Diamonds (MCD) made of synthetic production are the industrially produced supplement to natural diamonds. Thanks to modern manufacturing processes, diamonds can be produced in controllable quality, whose comparable properties correspond to the natural diamond. Alike the natural diamond, the cutting edge worked out of the single crystal block allows high precision and surface quality. Polycrystalline Diamonds (PCD) are formed when synthetically produced diamond dust binds under high pressure in a sintering process to form a diamond. The hardness of the material corresponds approximately to the hardness of mono-crystalline diamonds. Sintering leads to to a high fracture toughness, which makes thediamond material less sensitive to Impacts. CVD diamonds are synthetically produced by coating substrates by chemical vapour deposition (CVD). In a vacuum chamber, a diamond layer is deposited on the substrates (e.g. tungsten carbide base body). A gas mixture of methane and hydrogen is the starting material. Precondition for an excellent machining result and a long service life. In the case of monocrystalline diamonds, the crystal structure of the stone must be taken into account and processed in such a way that the crystal lattice and cutting edge are perfectly matched – a demanding task that requires know-how and sensitivity. Under high temperature and high pressure, the heterogeneous material mixture is used to produce the most homogeneous material possible with a defined property. Dressing is the name given to the preparation of grinding wheels before machining or after wear. A distinction is made between profiling and sharpening of grinding wheels. During profiling the grinding wheel gets a certain shape, during sharpening individual grains of the grinding wheel are broken out in the micro area and thus the grinding wheel becomes sharp again. Profile Dressers are used to give grinding wheels a defined shape. The diamonds in the dressers are precisely ground to a predetermined profile. The radius and angle of the diamond are important. 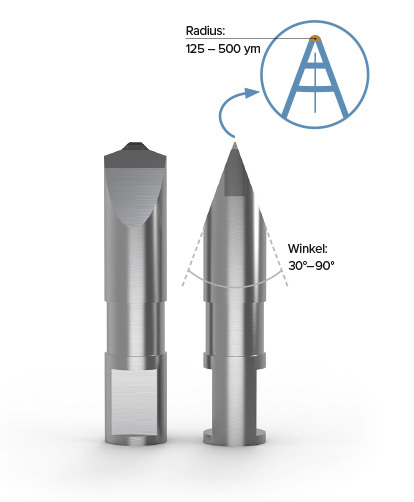 Singlepoint Dressers are used for dressing straight grinding wheels and consist of a oktahedral formed diamond which is soldered into a holder. The tips of the diamond can be natural or ground. Dressing Plates (Needle Tiles) are used for dressing straight grinding wheels and for profiling for high demands. In dressing plates, the diamonds made of MKD, CVD or natural needles are placed in a hard coating or metal binding before they get sintered. coarse dressing of straight and even grinding Wheel surfaces without scoring. Diamonds of selected quality are set by hand in several layers and held together with a sintered bond adapted to the application. Alternatively, diamond powder or diamond grain is sintered into a dressing element. Dressing and profile wheels are mainly used for straight dressing, but can also be used for profiling with single-row design. Diamond needles or selected diamond suture stones are used, which are reliably held by a sintered bond.